Hospital life has been hectic to say the least. Kate had a really bad evening yesterday and had a rough morning today. Her energy levels are way low but she doesn't understand so she plays really hard for about 15 minutes and then is miserable for hours. We have 2 more days of busulfan and then switch to the super nasty chemo drugs campath and cytoxan on Friday. We've been told it won't be fun at all. I took this picture Monday (I think - my days are running together). Kate's expressed makes it clear that food is the enemy these days. She's only had about 10 puffs all day today. We knew to expect it but I didn't realize it would happen this soon. Monday Kate decided she wanted to rock and read while getting chemo. Hopefully I can update more, with better pictures, soon! Also, if you have a second, and enjoy reading our blog, can you click on the badge below to vote for us? Simply clicking on it gives us a vote - and a boost in the ratings which will hopefully spread Kate's story and raise awareness about bone marrow transplants and donations! Thanks! Poor baby girl. That face is pitiful! Hope y'alls day gets better! She is such a brave little girl! (& you are a brave mama.) Hang in there! 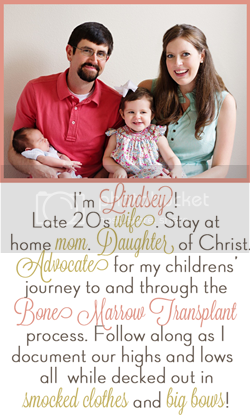 Lindsey, I've been thinking of y'all a lot and praying for you all throughout my days. I'm praying that these days fly by, you have the strength to take care of your girl and yourself, and that the Lord - along with the doctors and nurses - brings healing. Much love to all of you. And thanks so much for your sweet words on my post on Camille's birthday. Voted : ) Glad we got to chat today. Did you ever hear about isolation? God Bless you, Kate! Ugh, my heart aches to hear about your baby getting chemo. I am praying for her and you! My heart goes out to you and your baby girl. I hope God is by your side guiding you and holding your hand. She's beautiful and I pray she gets better soon. My prayers are going up right now for strength for sweet Kate and for you and your husband!